If you are not that adventurous with your taste buds, do not worry. There are many tasty options for you to try. This chewy cake is sweet and decadent. The ingredients are very local including ripe palmyra fruit, rice flour, yeast, palm sugar, and water. Palm sugar is very widely used in Cambodian desserts. 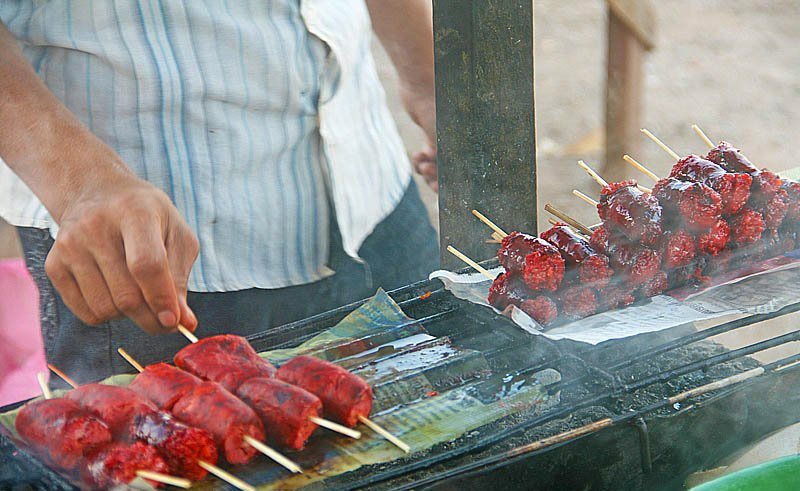 This much affordable street food can be found almost everywhere in Siem Reap. They are steamed in large pots, and served with coconut milk drizzled on top. Bamboo cooked rice: also called kralan in Khmer. This savoury snack is from sticky rice, black beans, and coconut milk. These ingredients are stuffed in a bamboo section, and then the whole thing is roasted for about 30 to 45 minutes. If you want to save your stomach space for more delicious snacks, we recommend you one bamboo section and split the rice up with your friend. 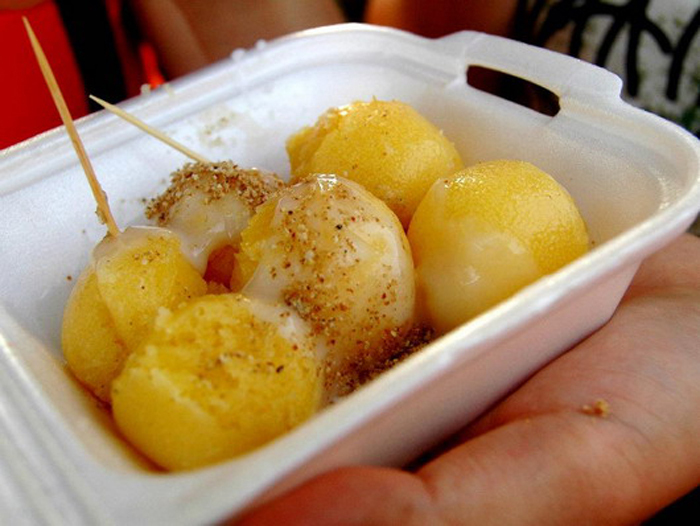 This street food is self-explanatory in its nature. Bananas are put on skewers, sprinkled with palm sugar, and then grilled on charcoal until the bananas are caramelized and turned golden. 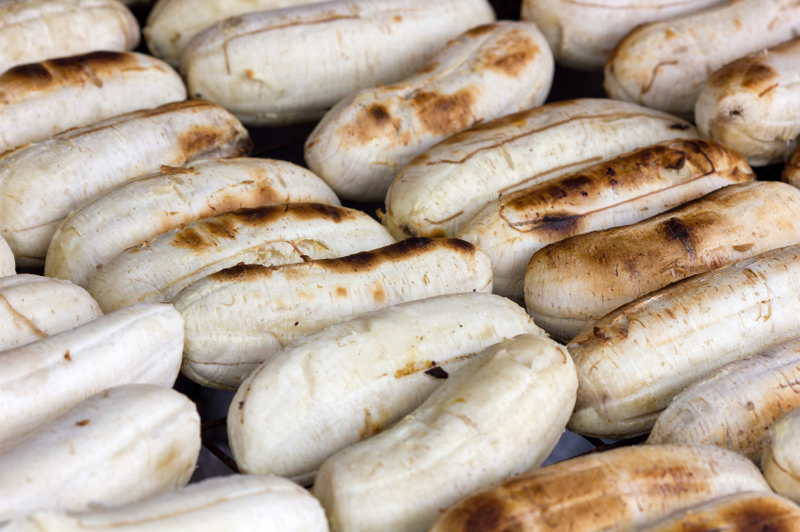 These sausages have a deep red color due to the spices used, and sold as a street BBQ decadent. Very often you can purchase a papaya salad to eat with. The salad includes papaya, dried shrimps, tomatoes, bean sprouts, cucumbers, chilies, garlic, etc. It is nom kachai in Khmer; you can buy these dumplings at the Old Market. 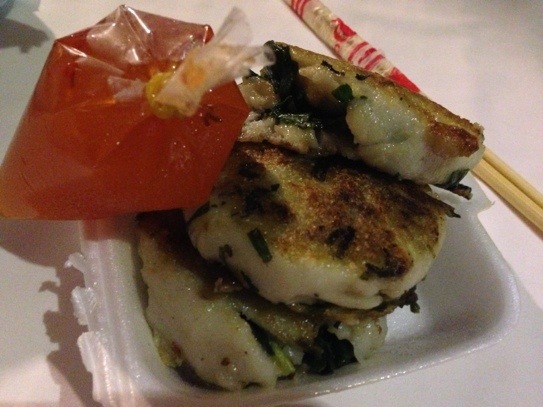 They are just rice flour pockets filled with freshly chopped chives, and fried in oil. Simple, but delicious, and most of all, cheap! They are served with a basic sweet and sour sauce that is a mixture of fish sauce, sugar, and vinegar. If you have not known, insects are integral to Cambodian cuisine. Ants, spiders, crickets, scorpions, silkworms, are highly nutritious because they are rich in protein. They are an inspiration to many common dishes. These are under consideration of the staples of Siem Reap street food; some say they taste like fried prawns. 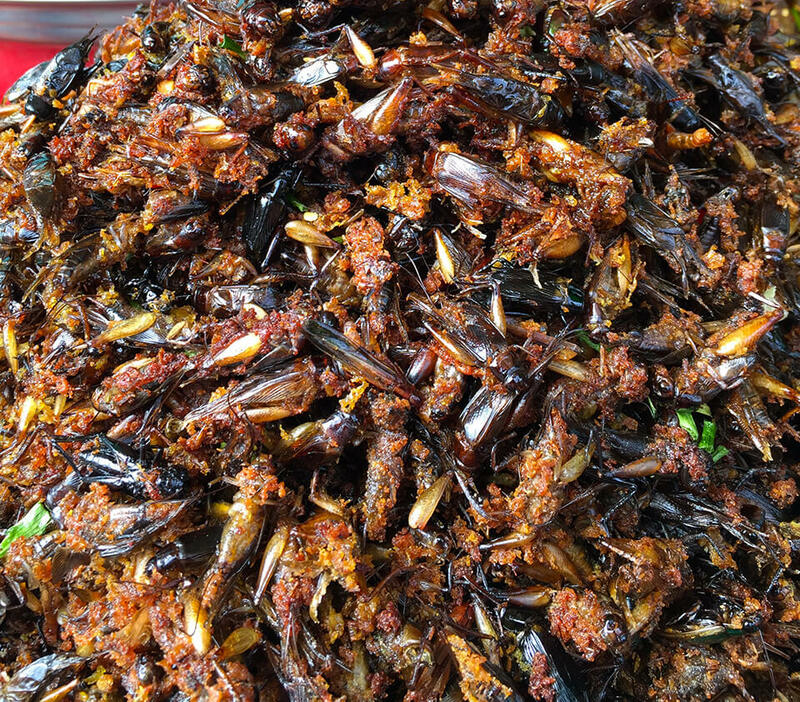 Like many other insects sold on the streets, the crickets and grasshoppers are seasoned with salt, palm sugar, chili peppers, and herbs before being deep fried. This results in a very crispy and crunchy texture. Again, the Old Market and Night Market are your safe bets. And while you’re in it, try the fried silkworms also (spoiler alert: they are a bit squishy in texture). We know you are familiar with grilled beef and pork, but how about grilled frog legs? Just like insects, Cambodian also has frogs in their diet. While it seems unappetizing to some, these BBQ frog legs are juicy and tender. Forget that you are eating a frog; it’s just meat anyway. Now that you have passed the frog phase, would you say yes or no to BBQ snakes? While you are still deciding in reluctance, these delicious reptiles are amongst the most popular street foods in Siem Reap. You can buy your own snake skewer for a cheap price of about $1. Are you a safe traveler or an adventurous foodie? Are you ticking that “I have tried weird Cambodian food” box or just staying content with the snake fruits? If you want to try, just ask your tour guide during your Cambodia cuisine and adventure 4 daysto take you to. No matter which you choose, we hope that you have a good time exploring the street food in Siem Reap tours!